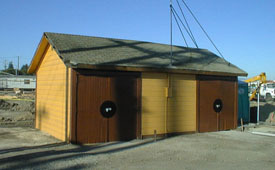 When the Santa Clara yard was expanded in 1926, the tower and a two bay Maintenance-of-Way (MoW) Speeder Shed were built. The MoW storage and work areas were needed due to the addition of many miles of rail within the yard. The north side of the divided shed originally housed a motorized speeder vehicle. The other bay was used as a work area. The shed is situated on its original location and measures 24’ wide by 12’ deep. 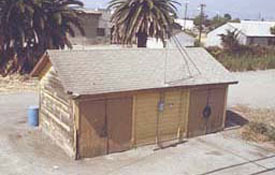 When the SBHRS came to the Santa Clara Depot in late 1985, the speeder was long gone and the Southern Pacific Signal Maintenance Crew was using the shed.